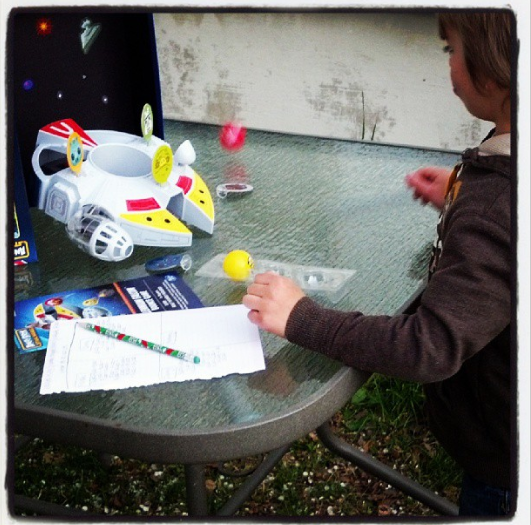 Cira's Lyrics: May the fourth be with you - Angry Birds Star Wars giveaway! 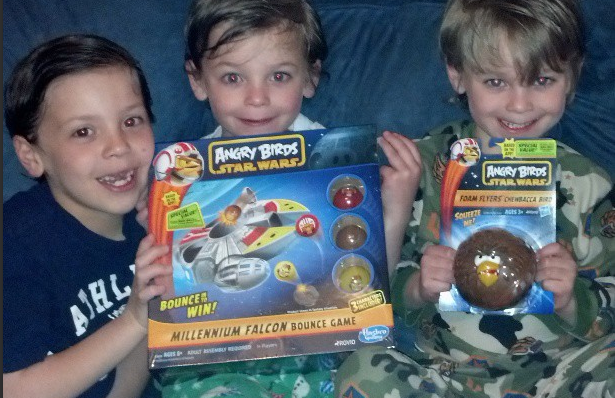 May the fourth be with you - Angry Birds Star Wars giveaway! Last week the boys and I arrived home from swim lessons to find a very exciting package sitting on our steps. A package so exciting, they all screamed. What was it you ask? The boys informed me they had been dying for these... ever since they started seeing the commercials on their favorite kids' channels. It was incredibly hard to get them to bed that night so I could take a look at the directions and set the Millennium Falcon Bounce game up for the next day. While ages 8+ are recommended, I still felt like this was perfect for my twin 5 (almost 6) year olds and my 7 year old. I took care of the assembly, which was just putting a few cardboard and plastic pieces together and adding the stickers. The next day I walked the boys through the game. With supervision, they picked it up very quickly. So quickly in fact, it has become their new favorite game. Believe it or not those points add up quickly with 3 boys competing for the win. Since my guys are still a little small, I added a notepad and paper so we can keep score together. I kind of like that it even gets them to practice a little math in the process! The game even comes with a unique code to unlock app content online. The Millennium Falcon Bounce game retails for aprox. $19.99 (and the foam flyer aprox. $9.99) and is available now in stores, as well as online with Hasbro. Want to see a little more? The boys made a short video explaining how they play the game. In honor of May 4th, Hasbro wants to spread some of the fun around so you too can have a chance for the fourth to be with YOU! I get to give away an Angry Birds Star Wars product on my blog! To enter, leave me a comment below telling me who you would give the game to. For an additional entry, tweet this blog post link to the giveaway - and make sure you come back to leave an additional comment with your twitter handle for verification purposes. This is a quick one y'all. 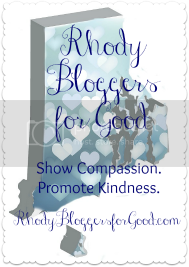 Contest closes at 3pm on May 4, 2013. Winner will be notified by email and must provide their mailing address. 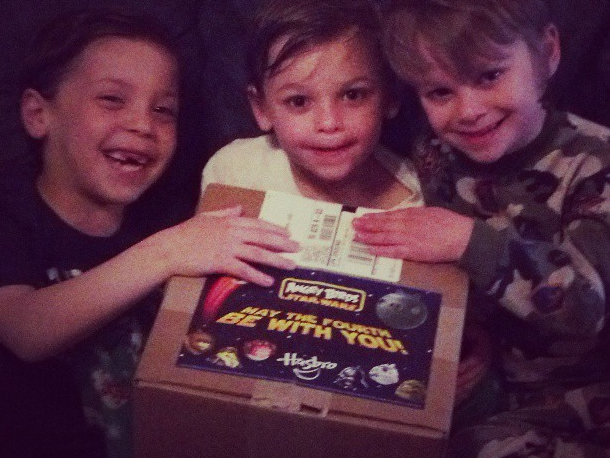 Angry Birds Star Wars product (of Hasbro's choice) will be sent directly to the winner from Hasbro. 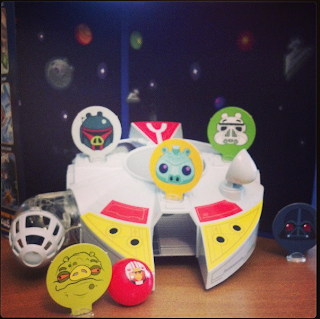 Good luck, and may the fourth be with you! Tomorrow ONLY (May 4th) - Use the Promo Code SWFANDAY for 20% off any Star Wars toy on HasbroToyShop.com ... pick up some of Hasbro's great Angry Birds Star Wars games and toys, based on the hit mobile game from Rovio Entertainment! I would love to win the game for my son!!! The Millenium Falcon looks AWESOME! Both of my kids would love this!!!! My niece and nephew would love this game! OMG This is way too much fun!!! Tommy would D.I.E if I won this - he is a HUGE Star Wars Angry Birds fan!!!! I would give this to my sons. I would give it to my brother & his kids!! He loves Star Wars! I would love to win this to donate to Cradles to Crayons. Nicholas would go NUTS for this!!! Nate would love this game!!! Bulks with the advertisers are primarily private home owners, letting managers and property agents. She invites one to visit her site where she's going to share a proven way to start an web business. either by email, live chat, or phone during standard west coast business hours.